Windows Vista hasn't been adopted joyfully by the masses, but consumers don't always have a say when it comes to the next Windows OS they'll be using. Most of us have to run whatever comes preinstalled on our machine of choice. And according to Microsoft, starting June 30th of this year, that OS will be Windows Vista only. There is an exception: A rag-tag group of small, cheap rebels that are exploding in popularity. Netbooks, mini-notebooks, ultraportables-whatever you want to call them-are bending the rules and reigniting Windows XP as a manufacturer-supported OS. You see, Microsoft has a clause in their Vista-only mandate. Knowing—and now openly admitting—that the OS is far more taxing on a system than XP, Microsoft has agreed to allow makers of "ultralow-cost PCs" to continue selling XP computers until 2010. And while Microsoft will only offer major support for the platform through 2009, limited support will be available for XP until 2014. Essentially, it's a loophole that Microsoft created for an entire new class of computers like the Asus Eee PC. The Asus Eee was a hit, already moving over 1 million units. And since then, countless other similar "ultralow-cost PCs" have been announced for the market by major manufacturers. Originally for the Eee PC (and others like OLPC's XO laptop) a Linux OS sufficed. 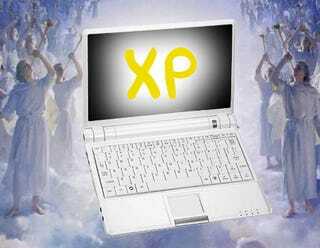 But consumer demand for a more familiar operating system led to the adoption of XP. Now, most of these mini-notebooks offer an XP option right out of the gate, at an added cost. Aside from the many small to medium manufacturers, the two biggest PC manufacturers, Dell and HP, have both jumped onto the mini laptop bandwagon. Here's where it gets interesting: HP's Mini Note does not support XP drivers natively, only Vista and Linux, and we don't know what OSs Dell will offer. But HP's system certainly qualifies for the exemption category because of its Via chipset, and Dell's very well might, too. If mini-notebooks continue to sell at the rate they're being produced, these big companies will definitely play a factor as to whether or not it's XP or Vista that's on them. Still, the upstarts have the momentum. XP-loving Asus expects to sell 10 million Eees in 2009 when the mini-notebook market is anticipated to reach 20-30 million units sold, says Reuters. That's a lot of computers ready for XP. Microsoft was clever. After announcing its intent to support mini-notebooks, it clarified (read: limited) the specs on "ultralow-cost PCs." Requirements include nothing bigger than a 10-inch screen (not a problem), limits on processor speeds (variable by make/model), a cap at 1GB of RAM and a limit on storage. So far, the RAM and storage rules have both been broken by Asus already. And it's probably only a matter of time before Atom processors top their current (released) speeds of 1.6Ghz and create yet another exception to Microsoft's rulebook. It will be interesting how XP popularity plays out from here-a game that's pretty much controlled by Microsoft at this point. But Microsoft is certainly allowing companies fudge the rules time and time again, probably because in the eyes of Ballmer and Gates, it sure beats some guy running Linux.